The Flower Pot is Skillfully handmade in terracotta and hand-painted with delicate details by Tribal Artisans from the interiors of India, ‘Tribal Pot-Faces’ is a set of two beautiful pots that doubles up as an Ethnic Table Top Accessory. 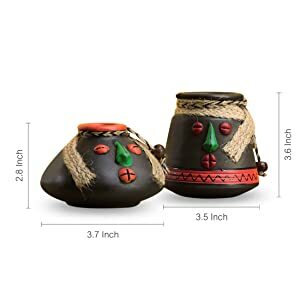 The set includes a rounder shorter pot(measuring 2.8 inch in height & 3.7 inch) and an elongated pot(measures 3.6 inch in Height & 3.5 Inch in Diameter), Hand Painted in beautiful contrasting Reds and Greens as details along with the classic addition of jute Dori representing Head Gear. The compact design and simple utility with the beautiful stone black on earthen terracotta, brings the earthiness of native culture and a fragment of India’s native legacy to all kinds of spaces..Inspired from indigenous Tribal Life and Aesthetics, these pots have been hand embellished with rustic Tribal Features in the Classic Stone Black Colors. The minimalist facial features and jute detailing compliment the Dholak shaped pot couple perfectly. 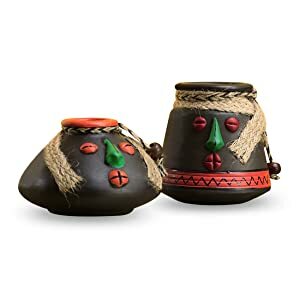 This set of face pots is a perfect decorative piece to be put in a living room or office. Hand embellished with rustic tribal features & minimalist facial expressions. Hand-Painted in a shade of Rustic Stone Black. This set of pots will definitely be a perfect piece of attraction for your guests.